Hello everyone! Today I am back on the Studio Katia blog with a birthday card I made using the Together We Bloom stamp set in combination with the Happy stamp set. I wanted to try my hand at some no line watercoloring, so I stamped my images using Distress ink in Antique Linen on some Canson XL watercolor cardstock, and I painted them with my Distress Inks. I used Victorian Velvet for the flowers and Bundled Sage for the leaves. Once my images were dry I cut them out using the coordinating dies. I then used the rectangle die in the Darling Ribbon & Dotted Frames Creative Dies set to cut my card base. The paper I used has an off-white color and a parchment like texture that I felt really matched the style of the card. The sentiment comes from the Happy stamp set: I stamped the word "happy" using Ranger Perfect Medium, and I coated it with Perfect Pearls in Perfect Copper. For the word "birthday" I used Memento Tuxedo Black ink. For a finishing touch I added some sequins from the Rose Gold Fusion sequin mix. And that's it for today's card! I really hope you like it, and I hope I inspired you to create with these beautiful stamp sets! Thank you all so much for stopping by, and have a great day! Hello everyone! Today I am back with a Christmas card I made combining stamps by Heffy Doodle with dies by My Favorite Things (MFT). This card is pretty easy to make and does not involve any particularly tricky technique, but I really love the result! I think it can be a great idea for mass producing Christmas cards to give to friends and family! And you can switch up characters and modify the color combination so that you get lots of variety starting from this design! To start off this card I stamped my images on some Neenah Solar White cardstock with Memento Tuxedo Black ink and colored them with my Spectrum Noir markers. The bear comes from the Heffy Doodle Unbearable Without You stamp set, the present comes from the Happy Snappy Crocs stamp set, also by Heffy Doodle, and the Santa hat is one of the images in the MFT Beast Friends stamp set. Once I was done coloring I fussy cut all the images with my scissors. For the Christmas ornament I used the MFT Tag Builder Blueprint 6, and for the snowflakes I used the MFT Let it Snowflake Too Die-Namics. I cut everything out of some heavyweight white cardstock. I then stamped my sentiment using Versafine Onyx Black ink: the word "hugs" comes from the Unbearable Without You stamp set, and the word "holiday" is one of the sentiments in the Lawn Fawn Frosty Fairy Friends set. For my card base and the ornament background I used some metallic paper with a linen-like texture that I got at a local store. If you don't have anything similar you can use smooth metallic cardstock or colored cardstock, they will both work perfectly! I cut the red panel with the Studio Katia Dotted Squares Creative Dies, and the gray panel with the Tonic Studios Square Layering set. I threaded some embroidery floas through the eyelet of my tag, and adhered everything using white glue and a fine tip applicator. As a finishing touch I added some Snow Crystals by Studio Katia. And that's it for today's card! I really hope you like it and I hope it provided you with inspiration for your Christmas cards! A huge thank you to Heffy Doodle for having me as a guest designer for the month of October, it was truly a wonderful opportunity, and I had a blast! I will be back soon with another fun project, and in the meantime I wish you all a great day! Hello everyone! Today I am back with the last card and video in my Halloween 2017 card making series, this time featuring products by Create a Smile Stamps and Nuvo Mousses. To start off the card I cut some black cardstock using a die from the Studio Katia Darling Ribbon and Dotted Frames Creative Dies set. 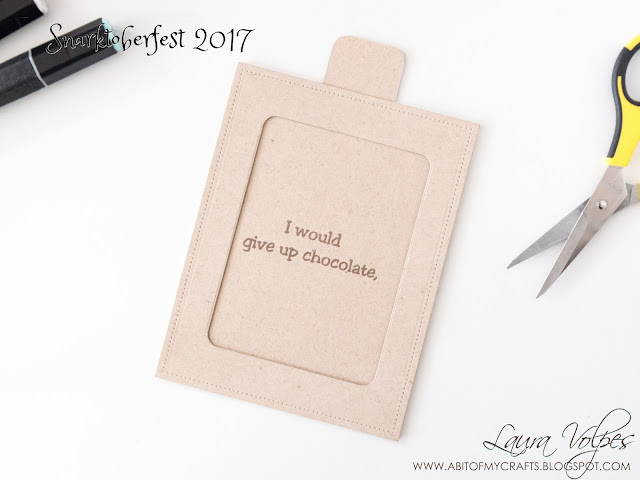 This die cuts to a standard A2 size, and it's so convenient that I use it in most of my projects! I then took the Create a Smile Concentric Circles stencil, taped it to my card base, and applied Nuvo Mousse in Black Aubergine in a more or less random way over the card base. I left everything to air dry. In the meantime I stamped some of the images from the Create a Smile Creepy Cute stamp set on Canson XL watercolor cardstock. I used Ranger Archival Ink in Jet Black and colored them with my Derwent Inktense pencils. I then cut them out using my Cutterbee scissors. To add some extra interest to my card, I took a strip of green cardstock and used the Clearly Besotted Basic Spots set to add some polka dots with Memento Tuxedo Black ink. I also used the Spectrum Noir IG1 marker to mute the green cardstock a bit, as I felt it was too bright. I stamped another image from the Creepy Cute stamp set on the top portion of my card with Distress Oxide in Twisted Citron, and I intensified the color with my Prismacolor pencils. To add a fun touch I adhered some googly eyes by Studio Katia all over the background. I also recorded a video tutorial for this card, you can watch it on my YouTube channel! With this card I would also like to participate in the current Simon Says Stamp Wednesday Challenge: Anything Goes. And that's it for today's post! I really hope you liked it, and I hope you enjoyed my first Halloween card making series - let me know which card and which video were your favorites! I will be back soon with another fun project, and in the meantime I wish you all a great day! Hello everyone! It's time for another Funday Friday Challenge over at the Jo's Scrap Shack blog, and this week I had fun playing with these adorable snowmen by Bugaboo stamps! How absolutely cute are they? I printed them on some Canson XL watercolor cardstock and colored them using my Inktense Pencils. The twist on this week's challenge was to use violet, sky blue and white, so I stuck to those colors on my card. I also added a few details using a white gel pen. Once I was done coloring I fussy cut around the little squares using my Cutterbee scissors. I stamped a snowflake image from the MFT Handwritten Holidays stamp set on some Neenah Desert Storm cardstock with Lawn Fawn Yeti pigment ink. While the ink was still wet I sprinkled my Nuvo Shimmering Pearl embossing powder over the stamped areas, removed the excess, and heat set it. To frame the card I cut some light blue cardstock using the largest die in the Craftin Desert Divas Inside Scalloped Squares set, and I mounted it on my card base with some foam tape. I glued down the four squares with the snowmen and the sentiment, and, for an extra touch of glitter, I coated the violet areas on my card with some Spectrum Noir clear overlay pen. Just make sure to follow the challenge guidelines down below and get crafty! I will be back soon with another fun project, and in the meantime I wish you all a great day! You have until October 20th by 6:00PM (eastern, USA) time to link up. All winners will be announced during the week of August October 20th. Hello everyone! Today I am really excited to share with you the card I made for my second post as a guest designer over at the Heffy Doodle blog! This time I decided to use the Happy Snappy Crocs stamp set for my main image, and to create a clean and simple card (at least compared to my usual style :) ). To start off, I stamped one of the images in the set on some Neenah Solar White 110lb cardstock and I colored it with my Spectrum Noir markers. I used Memento Tuxedo Black ink to do the stamping, as this ink doesn't smear when used with alcohol markers. I also added a few details to the crocodile with my white gel pen. I then used a die by My Favorite Things to cut out the hearth shaped balloon from some red cardstock, and the string from some gray cardstock. I coated the balloon with glitter using my Spectrum Noir clear overlay pen and added a highlight with a white gel pen. I cut my card base from some white cardstock using a die by Studio Katia, that I also used to cut some patterned paper by My Favorite Things. I adhered everything together using white glue. I stamped the happy birthday sentiment from the Happy Snappy Crocs set with Versafine Onyx Black ink, and, because I felt that there was a bit too much white space (clean and simple, right?! ;) ), I stamped the cloud image from the Unbearable Without You stamp set using Memento Ink in London Fog. And that's it for today's card! Quite quick to put together, but really fun with the croc carrying the birthday balloon! I really hope you like it too, and I hope I inspired you to create with these fun stamp sets! Thank you all so much for stopping by, and have a great day! The products are listed in no particular order. Whitout further ado, let's dive into it! The first tool I want to talk about is the Tonic Studios Guillotine Trimmer. I am really happy with this cutting tool: I can always get sharp, precise cuts, and cut the tiniest strips of paper. This particular one has an arm that allows you to cut paper up to 12x12", as you can see in the picture below. And the great thing is that you can remove the arm and tuck it in the dedicated slot under your trimmer to save up space. 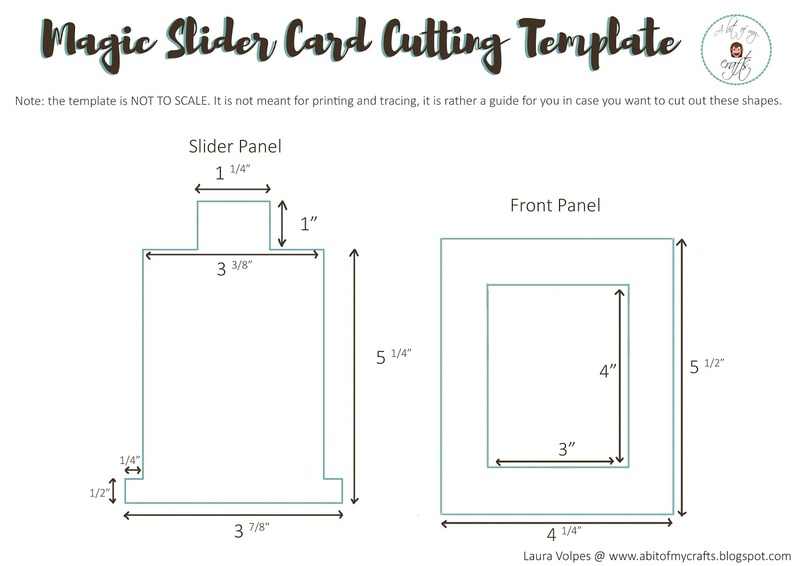 The second item I decided to include in my favorite list is my Big Shot die cutting machine. This particular one is electric, but there are hand operated models out on the market, which come at a lower price point. I personally decided to invest in a more expensive machine to save my hands a bit of work, but that's just my personal choice. Regardless of whether they are manual or electric, though, I think die cutting machines are one of the most common and most used crafty tools out there. They are used in combination with dies and allow to cut a variety of shapes from multiple materials. Whether it's scene building elements, frames, or geometric shapes, there is no single card I make without using die cuts! Card making would not be the same for me without my Big Shot. Another definite favorite of mine! Finally, I decided to include Versamark ink in the list of my favorite inks to work with. It is a clear, sticky ink that can be used for watermark stamping, which yields sort of a tone on tone stamping look, and for heat embossing when used in combination with embossing powder. There is no stamping without inks (with the exception of digital stamps, of course), so I really felt I should include them in my list of favorite tools! And these three are a must have for me! Another tool I wanted to talk about is the Pick Me Up tool. This tool looks like a pen: it has a removable cap, which exposes a tacky tip, and it also comes with a two pointed tool, that you can extract from the back. Because of the tacky material on the tip of this pen, you can use it very easily pick up sequins or tiny die cuts. The tool that you extract from the back helps you release the objects that you picked up from the tacky tip. 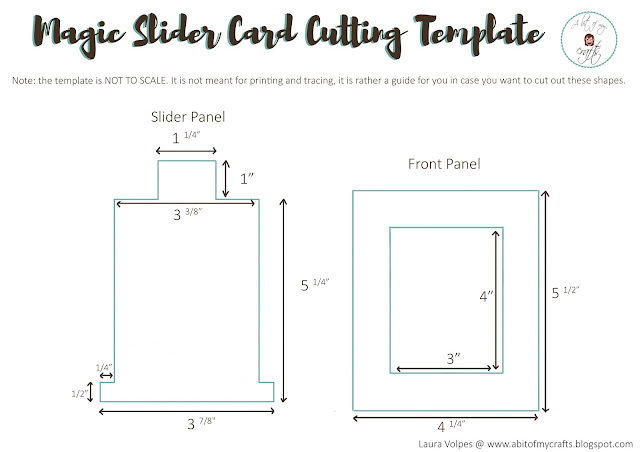 This comes in really handy when you are trying to glue small elements to your cards! And because of how much easier this tool made my life, it totally deserves a spot in my top 5! PS: There is also a very similar tool by WeR Memory Keepers. It is called Quickstik and it has exactly the same features. And, last but not least, my beloved Nuvo Drops. They are air drying embellishments that come in a fluid form. They are contained in bottles with a fine tip, for a precise application of the product. They come in a variety of colors and finishes: opaque, metallic, with glitter, semi transparent, and glow in the dark. What I really love about them is that I can add any size of embellishments to my cards: I just need to squeeze more or less product to get a larger or a smaller drop. Here are some examples of cards in which I used Nuvo Drops to add some finishing touches. The price point is also great, so you can get a variety of colors for a really good value. I personally really love the White Blizzard, which dries clear and has glitter in it, and the Jewel Drops: they dry transparent, but with a hint of color to them. You can see them on the card at the bottom right of the picture above: aren't they gorgeous?! And because of how beautiful and at the same time affordable they are, I could not leave them out of my top 5! And that's it for today's post! I really hope you enjoyed it, and I hope that it has provided useful information to some of you out there! Thank you all so much for stopping by, and have a great day! Affiliated links used at no cost to you. Hello everyone! Today I am back with another card and a video in my Halloween 2017 card making series, featuring the My Favorite Things Fab-BOO-lous Friends stamp set, as well as dies and stencils by MFT and Avery Elle. Before going into the card making process I wanted to tell you that this card is full, and I do mean full of mistakes! I guess it was simply not my day, but I pulled through and I am happy I did, because I do like the final result. So I thought it might be useful for you if I shared the whole process of making and fixing my crafty accidents :P I hope this will serve as an inspiration for some of you out there to not get discouraged, and try not to leave a project halfway through, even when the situation seems desperate! :D And even if it doesn't work out, you will still have practiced! Anyways, let's move on to the card: I stamped my images on some Neenah Solar White 110 lb cardstock and colored them with Spectrum Noir markers. I cut two panels out of some Strathmore Bristol Smooth cardstock using the Avery Elle Wonky Stitches dies and the MFT Stitched Triple Peek-a-boo Window. I used the MFT English Brick Wall Stencil and Distress Ink in Iced Spruce on the front panel, and the MFT Cloud Stencil and Distress Ink in Seedless Preserved on the background panel. I inked up the circle die cuts that I had left from using the MFT Stitched Triple Peek-a-boo Window with Distress Ink in Wild Honey. For some extra detail I stamped the little star trio from the Fab-BOO-lous Friends stamp set with Dust Ink in Wild Honey over the die cut circles. I stamped my sentiment and the bats from the same stamp set using Memento Tuxedo black ink and I assembled everything. For some added dimension I popped up the panel with the brick wall detail using some 3M foam tape, and I mounted everything on a black A2 card base. And that's it for today's post. I really hope you liked it and found it useful! I will be back soon with another fun project, and in the meantime I wish you all a great day! Ciaoo! Hello everyone! Today I am back with a card I made for my Guest Designer spot over at the Heffy Doodle blog! I was so incredibly happy when I was asked to guest design for Heffy Doodle, I am truly grateful that I was given such a wonderful opportunity! For my card today I used one of the adorable bears from the Unbearable Without You stamp set as my focal image: I stamped it on some Neenah Solar White cardstock with Memento Tuxedo Black ink, and colored it with my Spectrum Noir markers. I then created a little scene for my bear. I used a rounded rectangle die by MFT and a large circle die by Tonic Studios to cut some Canson XL watercolor cardstock. I created two panels: one for the sky and one for my grassy hill. I blended Distress Inks in Salty Ocean and Peacock Feathers on the sky, and for the grassy hill I used Twisted Citron. I also cut some clouds using dies by Lawn Fawn. I stamped the sentiment with Versafine Onyx Black ink. My card base is some gray cardstock on which I repeatedly stamped the heart image from the Happy Snappy Crocs stamp set, and for the middle panel I used paper from the Doodlebug Kittens Smittens 6x6" pad. I cut both using dies by Studio Katia. I popped up the front panel using some fun foam, and for a finishing touch I added some Studio Katia embellishments. And that's it for today's post! 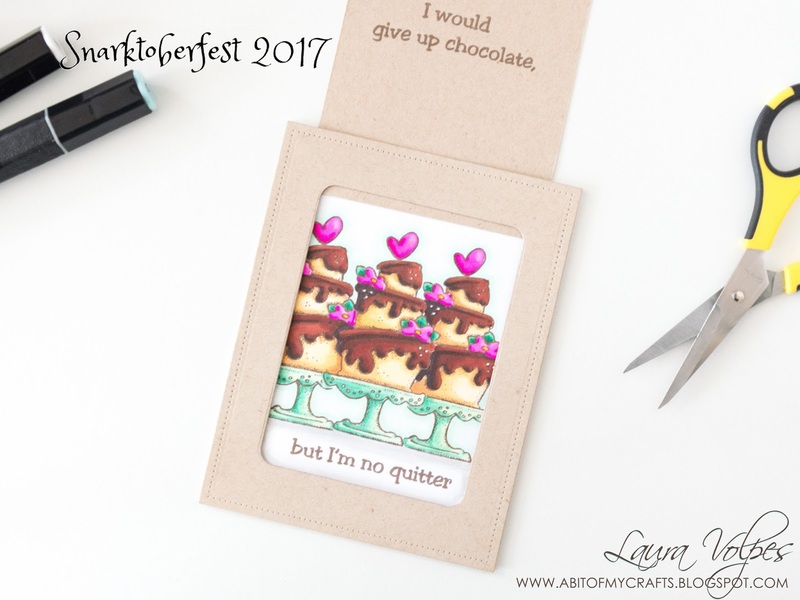 I really hope you liked this card, and I hope I inspired you to create with the adorable Unbearable Without You stamp set! Thank you all so much for stopping by, and have a great day! Hello everyone! Today I am back with some fun shaker tags and a video showcasing products from the Craftin Desert Divas October 2017 release. This release is absolutely adorable, and I really love the style of the images I used today! For the tags themselves I used some patterned paper by American Crafts, which I cut with the Craftin Desert Divas Shaker Tag dies. I also used a die from the Fancy Frame die set to cut a window in my tags. For the shaker background I did some ink blending on Bristol Smooth cardstock with Distress Inks in Candied Apple, Peacock Feathers and Mowed Lawn. I added some water splashes for a more fun look. I stamped my images on Bristol Smooth cardstock using Versafine Onyx Black ink, and colored them with my Zig Clean Color Real Brush Markers. For the color palette I was guided by the colors of the patterned paper I used on my tags. I then cut the images using my Silhouette Portrait, stamped the sentiments with Versafine Onyx Black ink, and assembled my shaker tags. I used the Fairy Dust sequin mix and a double layer of foam tape to make sure that the sequin would have lots of room to move around. I finished off the cards using some ribbons that I got at a local store. If you are interested in watching how I made these shaker tags, you can watch the video tutorial on my YouTube channel! And don't forget to let me know what you think about it! And that's it for today's post! I really hope you liked it and enjoyed the video. You can check out my Instagram and Facebook pages to see more inspiration for the new Craftin Desert Divas release! I will be back soon with another fun project, and in the meantime I wish you all a great day! Ciaooo! Hello everyone! 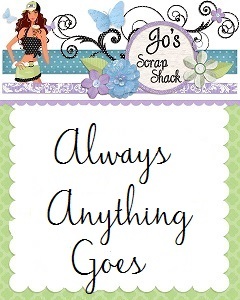 Today I am back with a card I made for the Funday Friday Challenge over at the Jo's Scrap Shack blog. This card features the Cuppa Love stamp set by Limited Runs, which is also the sponsor for this week's challenge. To start off my card I printed the image on some Canson XL watercolor cardstock, cut it with my Silhouette Portrait, and colored it with my Zig Clean Color Real Brush Markers. For my card base I used the Dotted Ovals and the Darling Ribbon and Dotted Frames die sets by Studio Katia to cut some patterned paper from the Doodlebug Cream and Sugar paper pad, as well as some blue cardstock from the Crafters Companion Astrobrights collection. The sentiment comes from the MFT Bitty Bears set, and I stamped it on some Canspn XL watercolor cardstock using Memento ink in Rich Cocoa. I also used the MFT Stitched Sentiment Strips Die-Namics to cut a banner for my sentiment. As a finishing touch I stamped some coffee beans from the Lawn Fawn Love You a Latte stamp set with Memento ink in Rich Cocoa and cut them with the coordinating dies. And that's it for today's card. Pretty quick to come together, but really pretty thanks to the detail added by the patterned paper. Remember that you can join the Funday Friday Challenge (the theme is Anything Goes) for your chance to win three digital stamps by Limited Runs! Just make sure to follow the challenge guidelines included at the end of this post, and get crafty! I will be back soon with another fun project, and in the meantime I wish you all a great day! Hello everyone! Today I am on the Studio Katia blog with a fun Halloween card I made using images from the Kobi the Grim Reaper stamp set. To start off my card I stamped my images on some Neenah Solar White cardstock with Memento Tuxedo Black Ink and colored them in with my Spectrum Noir markers. I then cut them using the coordinating dies. I also used my craft knife to cut some slits around Kobi's paws, so that I could slide the scythe right through. For my background I did some ink blending on a piece of heavyweight white cardstock with Distress Oxides: I used Faded Jeans, Seedless Preserves, Worn Lipstick and Wild Honey. I created a distressed look by adding some water splashes. For the outside frame I cut some black cardstock using the Dotted Patterns - Fancy Square die and did some more ink blending with Distress Oxides in Iced Spruce and Black Soot. I stamped the little spider on the sky, as if it was hanging from the frame, and adhered everything in place using some white glue. And that's it for today's card! I really hope you liked it, and I hope I inspired you to create a fun Halloween card using the Kobi the Grim Reaper stamp set! Hello everyone! Today I am back with another card and a video in my Halloween 2017 card making series, this time featuring the Clearly Besotted Stamps All in Onesies Halloween stamp set - sooo stinkin' cute! For my card I stamped three of the images in the set with Memento Tuxedo Black ink on Neenah Solar White cardstock, and colored them with Spectrum Noir markers. I then fussy cut them using my Cutterbee scissors. I wanted to create a fun and playful card to go with the feel of these images, and I thought that the straw splashes technique I had featured in one of my previous cards would be just perfect! To change things up a bit, instead of Distress Inks I used my Oxides. I used Wilted Violet, Twisted Citron and Spiced Marmalade to create splashes on a piece of Canson XL watercolor cardstock that I had cut using a die by Avery Elle. I first smooshed the ink pads on my craft mat and diluted the ink with water. I then transferred the ink to my card base with some acetate, and used a straw to create the splashes. I cut a strip of vellum and adhered it to the front of my card: this helps the three little kids, that I adhered onto the vellum strip, not to get lost in the busy background. I stamped the sentiment using Memento Tuxedo Black ink, adhered the front panel to my A2 black card base with some fun foam, and added a few black Nuvo drops to finish off the card. And I have to say I really like the result! This technique is really quick and fun, and because of the oxidation properties of the Distress Oxides, you can achieve a really nice texture within your splashes! If you want to see the card making process and are interested in this technique, you can watch the video on my YouTube channel. And that's it for today's post! I really hope you liked my card and enjoyed the video! I will be back soon with another fun project, and in the meantime I wish you all a great day! Ciao! Hello everyone! 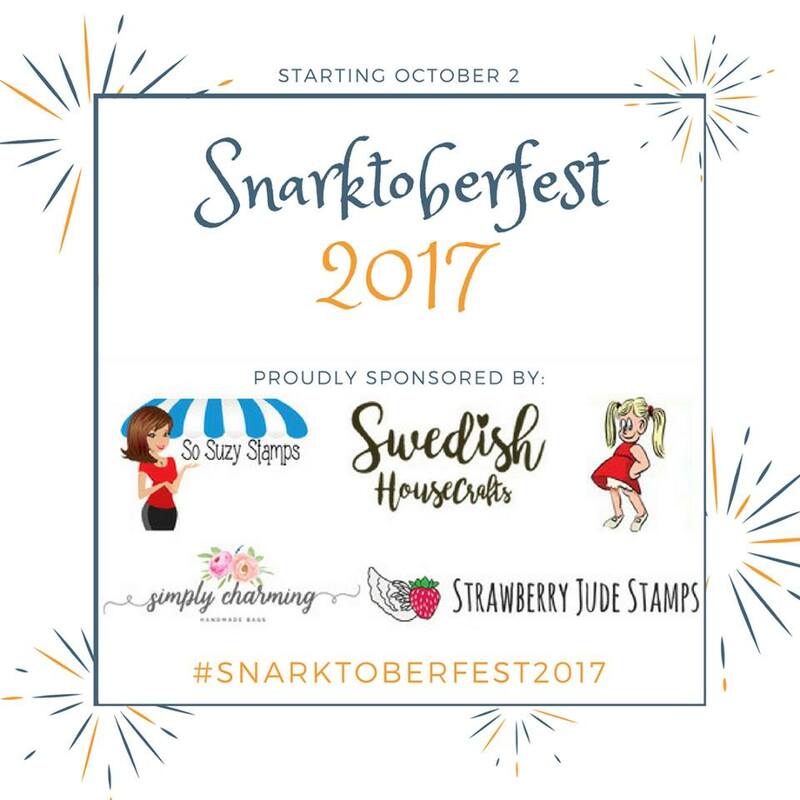 Snarktoberfest 2017 is kicking off, so brace yourselves for a month long of funny and snarky inspiration! Whohooo! 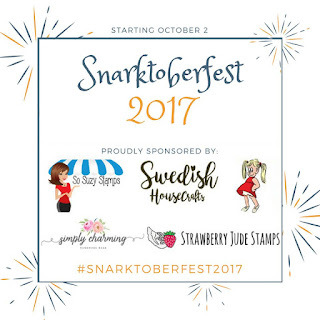 I am super happy to be part of a blog hop in celebration of the Snarktoberfest (thanks Josefine, I hope you realize that this means I will keep stalking you :P), and today I will be sharing a slider card I made for the occasion. I used stamps by Gummiapan and Magnolia stamps, kindly sent to me by the Swedish House Craft store, and created a fun slider card! For the front panel I used a die by Studio Katia to cut some Neenah Desert Storm cardstock to a standard A2 size, and then created an opening using the Lawn Fawn Stitched Journaling die. I then designed and cut the sliding panel, as I don't have a die that creates a magic slider card (one more item in my already pretty long wish list :D ). For the measurements you can refer to the image included below. Just please note that the image is not to scale: it is meant to be a visual guide for you, not something to print and trace. I do hope it will be useful to someone out there, though. After having created the slider panel I stamped the sentiment using Memento Dew Drops is Rich Cocoa. For the inside of the slider I cut some Neenah Solar White cardstock using the same Studio Katia die that I used for the slider front. I did some masked stamping for the cakes with Memento ink in Rich Cocoa. I stamped the second part of the sentiment too and colored my images with Spectrum Noir markers. I then backed the slider front panel with foam tape, making sure I would leave enough room for the slider to move freely. I also created a video tutorial showing the whole card making process, you can watch it on my YouTube channel! Here is the list of all the amazing crafters that participated in the blog hop! Have fun hopping! Thanks again to Josefine and the sponsors for this super fun blog hop! And that's it for today's post! I really hope you liked this card and enjoyed the video, and don't forget to hop along and leave a comment on all the blogs in the hop for your chance to win one of the prizes listed above! I will be back soon with another fun project, and in the meantime I wish you all a great day!